Being a fan of any sports team is pretty stupid. [Disclaimer: I am a fan of sports teams.] What I mean is that if you’re a “real” fan, you spend a ridiculous amount of time watching your team and reading about your team and talking about your team. And you spend a ridiculous amount of money supporting your team – on shirts and jerseys and hats and tickets to games and food at games and on bathrobes with the team logo on it and on license plate holders and coffee mugs, and on socks – you get the idea. And if you’re a casual fan, you do the same, but without being obsessed. And what do you get for all of this invested time and money? You don’t know the players. You don’t get to hang out with them. They don’t pay you. They don’t stand around the water cooler and talk about what a great job you did at work the day before. They don’t even know you exist (unless you’re one of those stalker fans, or one of those crazy fans who is famous for acting like a fool at every home game). So why are we sports fans? Why do some of us invest ourselves so fully into “our” teams? I don’t remember the year, but I remember watching my first hockey game on TV. It was the early 90s; my cousin was over and he turned on the Rangers game. I was hooked. And in 1994, I was at the same cousin’s house when the Rangers won the Stanley Cup. I begged my mother to buy me the Stanley Cup hat. I wore it every day. I even wore it to sleep some nights. I still wear it today, all worn and torn, but usually only to games. I remember how upset I was later in ’94 when the baseball season ended with a strike in August. The Yankees were in first place – I thought I’d never see them that good again. I vowed to never watch the game again. When they came back the next season, I didn’t watch right away. But my whole family was watching, maybe as torn as I was, on a September night when Cal Ripken, Jr. played his 2,131st consecutive game, breaking Lou Gehrig’s record. In 1998 I started grabbing the sports section out of the newspaper the day after Mark McGwire hit a home run. I cut out every box score. I’d like to say I predicted he’d break the Babe’s record. I still have those box scores and articles in a binder somewhere in my basement. In 2001, two friends and I took a road trip. We didn’t know where we wanted to go and didn’t want to drive around aimlessly for a week, so we picked some baseball stadiums and started driving. Five years later we had visited every team in their home stadium at least once. Even now, when any team gets a new stadium, we’re on the phone setting up a new trip. That same year, 2001, those friends and some others were at my house watching Game 4 of the World Series. Down 2 games to 1, and down 3-1 in the 9th inning, Tino Martinez hit a game-tying home run. Without thinking, I hurdled the coffee table in my parents’ living room landing one of my friends. The next inning, when Derek Jeter hit a game-winning walk off home run, I did the same. When Game 7 seemed in the bag, but a bloop hit over Jeter’s head ended the game with the Yankees losing, my father and I sat there in silence for who knows how long. I remember watching the gold medal men’s hockey game during the 2010 Olympics. My daughter was just a baby, sleeping in her swing. Her swing was across from the couch I was sitting on. And the United States tied Canada with 25 seconds left in the game. My wife wasn’t happy with the result. And she wasn’t happy almost 8 minutes into overtime when I started cursing after Sidney Crosby scored and the baby started crying again. My daughter started sitting down and watching Rangers games with me some time when she was two years old. We still watch them together. Sometimes she yells at the television, just like her father. When the Rangers score, we high-five, just like I still do when I watch the Yankees with my father and they score. When she was two and a half, we took her to her first game at Yankee Stadium. She barely knew what was going on, but she had a great time. Last time we went, she got a foul ball. A year and a half ago I took her to her first hockey game. The Rangers played in Nashville. We got there super early so she could stand by the glass and watch warm-ups. She saw her first game at the Garden last year. And I’ve taken her to see a bunch of National Women’s Hockey League Games. Now she’s learning how to play. Being a fan is more than just living and dying with your team. It’s more than watching grown men make history playing the same game you played as a kid, when you were wishing you were on that big field. It’s more than having memories of great games. So why do we invest ourselves so fully in our teams? It’s laughing and screaming with your father over a home run or a World Series win. It’s hoping for a fight at a hockey game, and seeing it, thanking your father for hanging around when you know he really wanted to leave. It’s your mother asking about the rules of hockey and still not getting it, or almost starting World War III at a game, knowing your dad has your back. It’s being at the stadium with your family or friends. It’s hanging out with friends, or jumping on them after a big win. 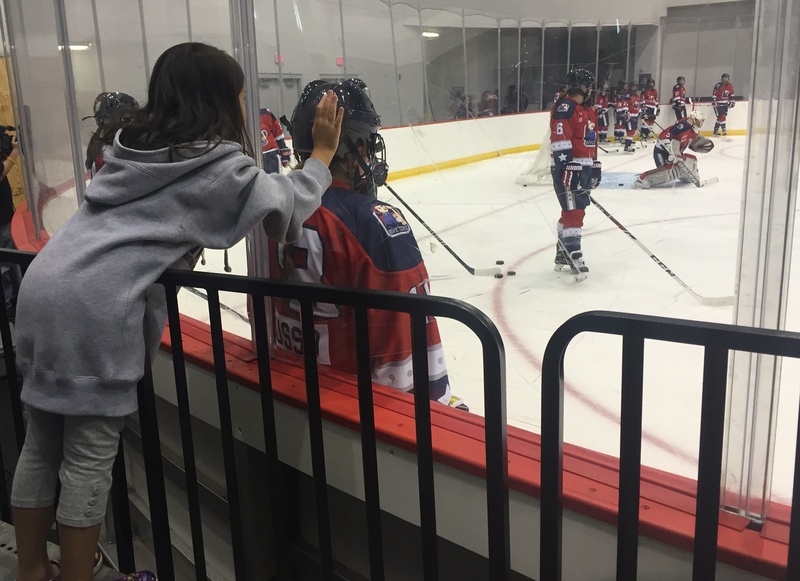 It’s bringing your daughter to watch women play pro hockey, and seeing her interact with those players after the game. It’s hearing your daughter get pissed at a bad play and cheer for a big hit or a fight. And it’s the huge smile on your daughter’s face at the stadium for her first Rangers game. And second. And third. Next Do Local Elections Matter?